Unitarian Universalism creates change: in ourselves and in the world. Seven days a week, UUs live their faith by doing. In community and as individuals, we know that active, tangible expressions of love and justice are what make a difference. Unitarian Universalist congregations are committed to seven Principles. These include the worth of each person, the need for justice and compassion, and the right to choose one’s own beliefs. Our faith communities promote these principles through regular worship, learning and personal growth, shared connection and care, social justice and service, celebration of life’s transitions, and much more. Our faith tradition is diverse and inclusive. We grew from the union of two radical Christian groups: the Universalists, who organized in 1793, and the Unitarians, who organized in 1825. 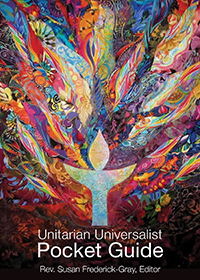 They joined to become the Unitarian Universalist Association (UUA) in 1961. Both groups trace their roots in North America to the early Massachusetts settlers and the Framers of the Constitution. Across the globe, our legacy reaches back centuries to liberal religious pioneers in England, Poland, and Transylvania. Today, Unitarian Universalists include people of many beliefs who share UU values of steadfast love, justice, and curiosity. We are creators of positive change in people and in the world.